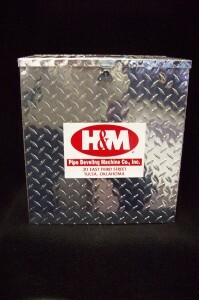 Storage Boxes - H&M Pipe Beveling Machine Company, Inc. Protect your investment with H & M’s new aluminum diamond plate storage boxes. The piano hinged lid with with spring loaded recessed handle reduces the space needed for storage. Our new style storage boxes are currently available for model 0 through 2. 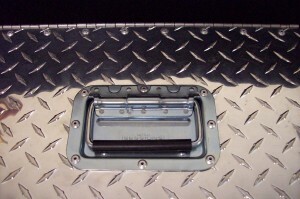 For larger machines (models 3 through 5) our standard aluminum storage boxes are still available. H & M’s storage boxes will insure that your quality standard saddle type machine will perform flawlessly from job to job.